Why did I come to AIU? I wanted to experience Japanese culture and learn how to speak Japanese. But it’s impossible for me to take classes taught in Japanese with my current Japanese ability. At AIU, almost every class is taught in English. So, I thought AIU is a good school for both learning English and Japanese, as well as traveling and experiencing Japan. I met a lot of good friends at AIU. These friends are who I spend the most time together with. There are two Korean friends Jin-tae and Dong-kyu, one Hawaiian friend, Sophie, one Australian friend, Mari, and one French friend, Julie. So, my new friends and I planned to go to a hot spring, which was very cool. The hot spring we went to is called Satomi. This was my first time to go to a hot spring in Japan, so it was a wonderful new experience. After taking a rest in the hot spring, we went to a sushi restaurant. Actually, I didn’t eat sushi because I don’t like raw food. But I went anyways to experience the atmosphere with my new friends. When my friends found out, they all exchanged their eggs sushi rolls with my sushi so I would be able to eat with them. This experience built a new and lovely memory about Japan. Before coming to AIU, I was worried about meeting friends, but now I am living a happy school life because I have made so many good friends. Another reason why I think it was good reason to come to AIU is because of the Nihongo house. I am a member of the Nihongo House, a themed house at AIU. 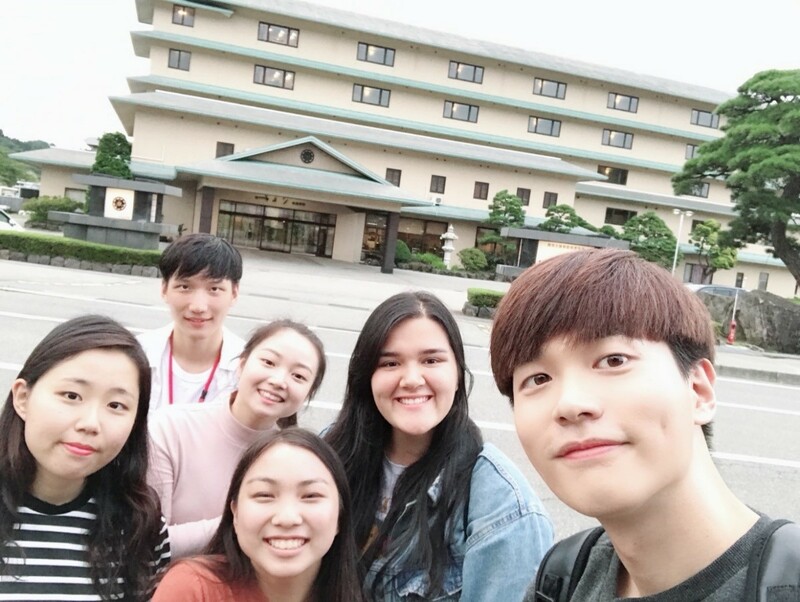 The Nihongo House is a dormitory where you live together, hold various activities using Japanese language, improve your Japanese language, and experience Japanese culture. The Nihongo house holds regular meetings on every Monday. At the first meeting, each person wrote down the activity they want to do and everyone decided when to do it. We have had two events so far, which is the Ore-no Tea & Coffee and the Ore-no Bread Series. While enjoying our tea, coffee, and various breads, we also build up our Japanese skills. The meetings are held at the lounge, a room where you can go to at any time. You can go there to read books or watch DVDs that are available to study Japanese. In addition, we planned to do outdoor activities together. I am already looking forward to it and hope that my Japanese skills will improve quickly. Besides, there are many good impressions and memories that I experienced at AIU. When I first came to AIU, I felt there was nothing to do. Eventually, I learned how to adapt to this new enviornment and I participated in many fun activities at school with my new friends. I'm so satisfied with my life here and even if I was asked to choose a school again, I would choose AIU. Thank you to Konkuk University and AIU for such a great opportunity.